#2. Fesenkov Astrophysical Institute, Almaty, Kazakhstan. 1. 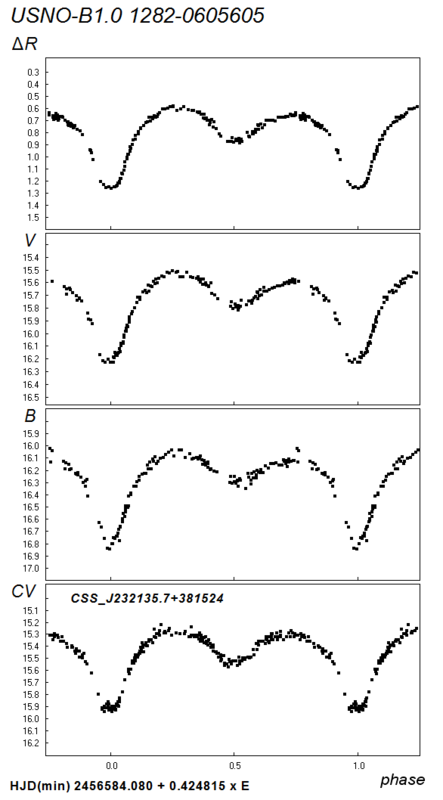 We detected variability of NSVS 547680 in the NSVS data. 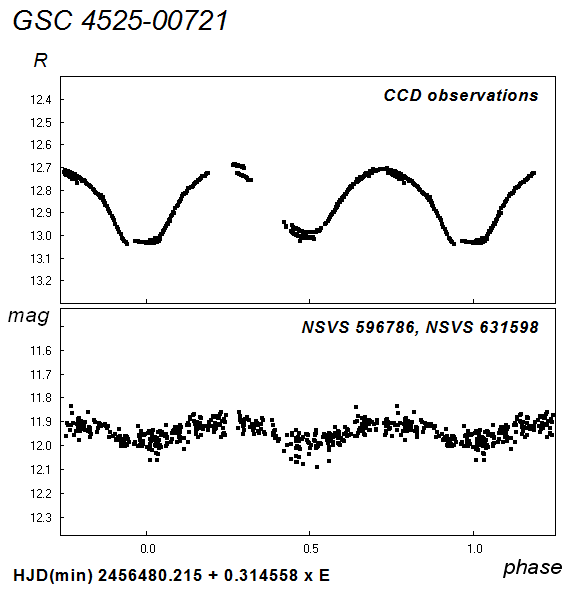 Combined brightness of two stars: GSC 4347-01515 (= var) and GSC 4347-01707 (constant), was measured in the NSVS survey, thus the amplitude is considerably underestimated. The ROTSE data with photometric correction flags were kept for the analysis. MinII = 12m.37 (R). Small O'Connell effect is possible: MaxII = 12m.14 (R). 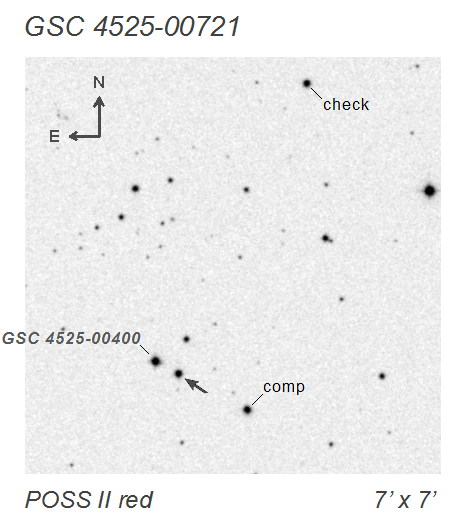 The comparison star was GSC 4347-01707 and the check star, USNO-B1.0 1598-0075392. 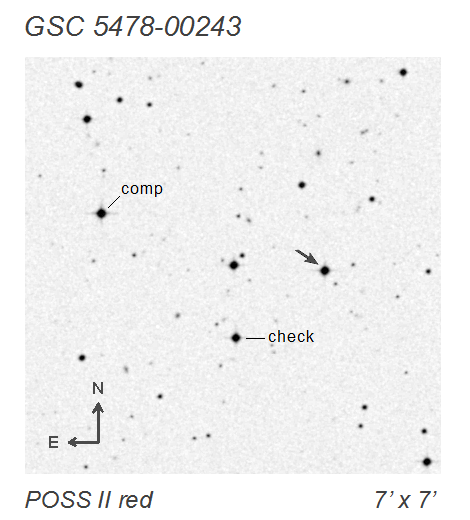 The R magnitude of the comparison star is 12m.73 in the GSC2.3 catalog. 2. 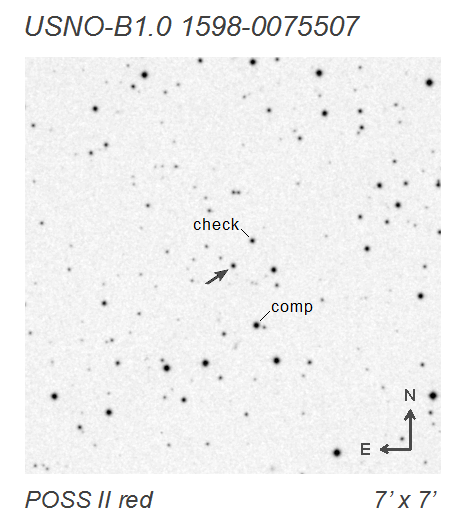 The comparison star was USNO-B1.0 1597-0078695 and the check star, USNO-B1.0 1598-0075495. MinII = 15m.66 (R). The R magnitude of the comparison star is 13m.99 in the GSC2.3 catalog. 3. 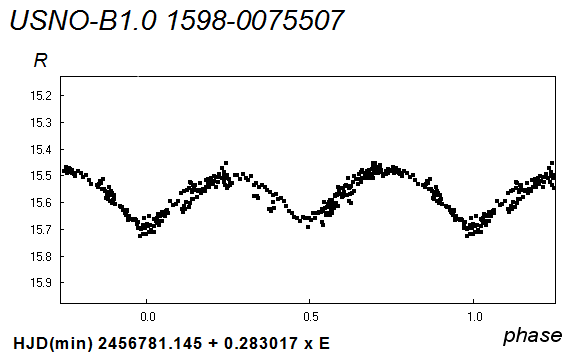 The star's variability was detected in the NSVS data (NSVS 2191601 and NSVS 2218454). 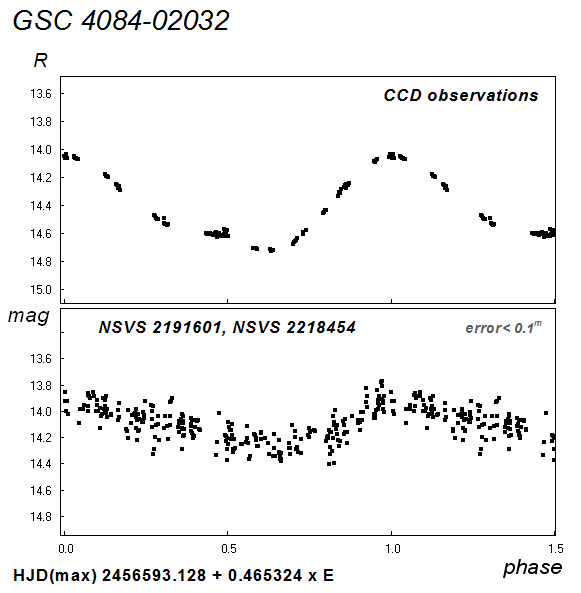 Combined brightness of two stars: GSC 4084-02032 (= var) and USNO-B1.0 1523-0167905 (constant), was measured in the NSVS survey, thus the resulting amplitude is considerably underestimated. M–m = 0.36 P. The comparison star was USNO-B1.0 1523-0167905 and the check star, USNO-B1.0 1523-0167988. The R magnitude of the comparison star is 14m.34 in the GSC2.3 catalog. 4. 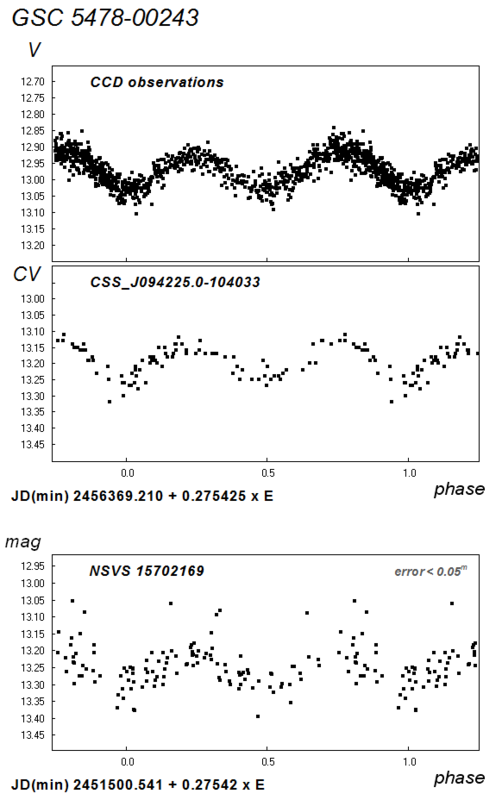 The star's variability was detected in the NSVS data (NSVS 596786 and NSVS 631598). 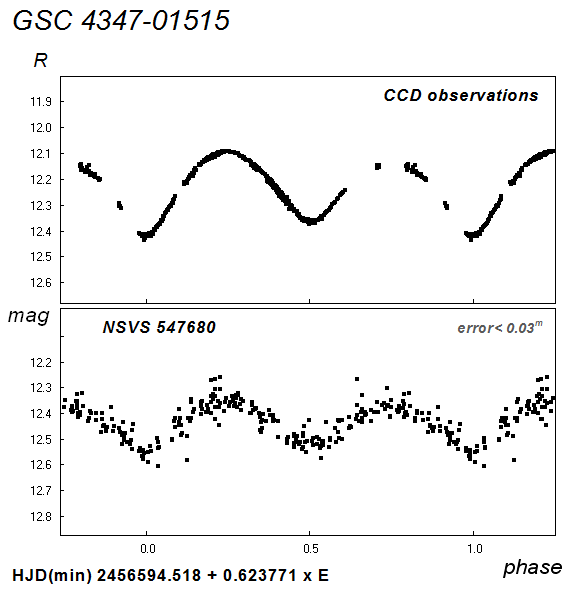 Combined brightness of two stars: GSC 4525-00721 (= var) and GSC 4525-00400 (constant), was measured in the NSVS survey, thus the measured amplitude is considerably underestimated. 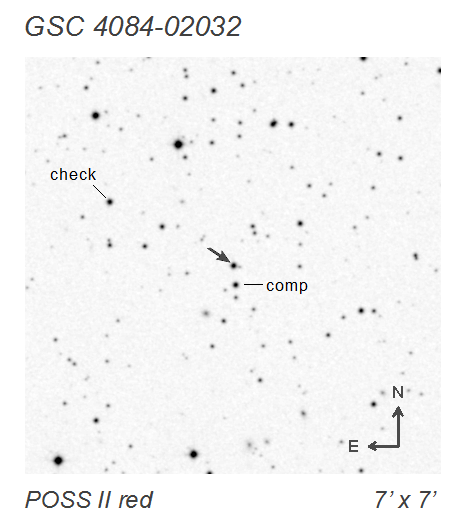 According to our CCD observations, GSC 4525-00721 varies. MinII = 13m.01 (R). The comparison star was GSC 4525-00674 and the check star, GSC 4525-01465. 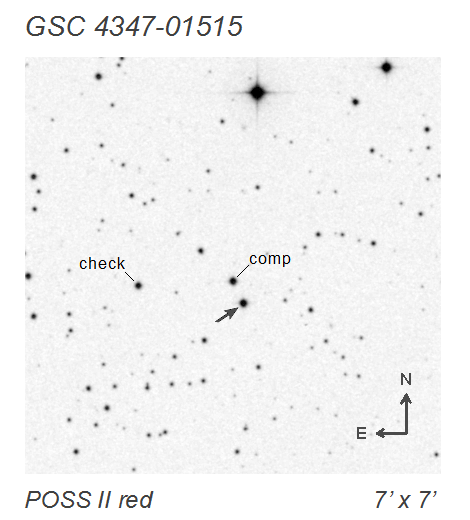 The R magnitude of the comparison star is 12m.55 in the GSC2.3 catalog. According to our CCD observations, the mean brightness possibly varies. 5. From CSS data, 13m.11 – 13m.28 (CV); from NSVS data, 13m.2 – 13m.3 in the R band. According to NSVS data, the light elements are: JD(min) = 2451500.541 + 0d.27542 × E. The ROTSE data with photometric correction flags were kept for the analysis. A weak short-period signal can be detected in the ASAS-3 (Pojmanski 2002) data, but large photometric errors make the analysis impossible. From our CCD data, MinII = 13m.04 (V). The comparison star was TYC 5478 01013 1 and the check star, GSC 5478-00751. The V magnitude of the comparison star is 12m.523 in the Tycho-2 catalog. Preliminary results from our new CCD observations were published by Kusakin et al. (2013). 6. MinII = 15m.81 (V). The B–band range: 16m.03 – 16m.84; MinII = 16m.33 (B). We could not calibrate the R magnitudes; the magnitude difference with the comparison star varies from ΔR = 0m.58 to ΔR = 1m.26; MinII = 0m.88. Small O'Connell effect: MaxII = 15m.58 (V), MaxII = 16m.11: (B), MaxII = 0m.64 (Δ R). 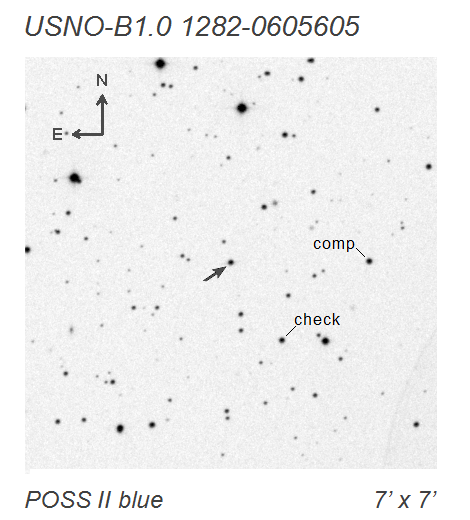 The comparison star was GSC 3230-00588 and the check star, USNO-B1.0 1282-0605581. The magnitudes of the comparison star are V = 15m.089 and B = 15m.936 in the APASS catalog (data can be downloaded here). From CSS data, 15m.22 – 15m.94, MinII = 15m.57 (CV). We present our discovery of six new variable stars. Our CCD observations were performed at the Tien Shan Astronomical Observatory of the V.G. Fesenkov Astrophysical Institute, at the altitude of 2750 m above the sea level, using a Zeiss 1000-mm reflector with an Apogee U9000 D9 CCD photometer (stars No. 1–4 and 6) and a Ritchey–Chretien 360-mm reflector with a CCD SBIG ST-402 photometer (star No. 5). We obtained frames mainly in the Johnson R band but also in V and B bands. Reductions were performed using the MaxIm DL and the MuniWin aperture photometry packages. These observations were analyzed using the period-search software developed by Dr. V.P. Goranskij for Windows environment. The finding charts identify the variable stars, comparison stars, and check stars. The magnitudes of the comparison stars are given according to GSC2.3 and Tycho-2 catalogs. The coordinates of variables were drawn either from the 2MASS (Skrutskie et al. 2006) or GSC2.3 catalogs. We discovered the variability of some of the variables (stars No. 1, 3 and 4) in the Northern Sky Variability Survey (NSVS; Woźniak et al. 2004) data, but in all these cases combined brightness of two stars was measured, and the tabulated amplitude is considerably too low. The problem was solved with the Zeiss 1000-mm reflector. To improve periods of the variables, we analyzed all available observations of these stars from the Catalina Surveys (CSS; Drake et al. 2009) and from the NSVS. After the completion of this study, we got knowledge of the recent publication of the Catalina team (Drake et al. 2014) with vitrually the same results for our star No. 6 (= CSS_J232135.6+381524). Acknowledgements: The authors are grateful to Dr. V. P. Goranskij for providing light-curve analysis software. We wish to thank M. A. Krugov, N. V. Lichkanovsky, I. V. Rudakov, and W. Mundrzyjewski for their assistance during the observations. This study was supported by the Russian Foundation for Basic Research (grant 13‑02-00664), the Programme "Non-stationary Phenomena in Objects of the Universe" of the Presidium of Russian Academy of Sciences, and the program "Studies of Physical Phenomena in Star-forming Regions and Nuclear Zones of Active Galaxies" of the Ministry of Education of Science (Republic of Kazakhstan).